Ellis Associates is an Alberta (Canada) based company with twenty-seven year experience. Our studio is located in downtown Edmonton near the Convention Centre. Our employees have a diverse knowledge of model fabrication and material simulation. Our discipline is focused on precision and realism. The team's professional training includes University Degrees and Diplomas in: Architecture, Aviation Technology and Art. 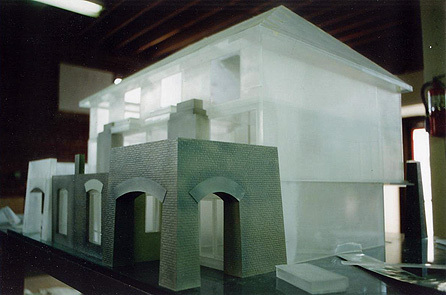 Our expertise in model fabrication has developed over the company history through an exchange of ideas and dialogue with Architects and Designers. Our ultimate goal is to work as an integrated member of the design team to achieve the desired stylistic expression of a project. We provide three general categories of models; Massing, Conceptual and Detailed. There are varied levels of detail within these categories that allow us to tailor budgets accordingly. Our clients are primarily Corporate Architectural Firms in Alberta, but we have built models for firms in Florida, Arizona, Texas, California and Hawaii. Ellis Associates also have a broad experience in the design and fabrication of Interactive Exhibits for Science Centres, Museums and Foundations. We work in the capacity of General Contractor for Designers or we work in a turn-key capacity assuming all responsibilities of concept design, mock-ups, working drawings and fabrication. A cross-section of our Architectural and Exhibit work can be viewed in our portfolio. Ellis Associates are currently promoting our Laser Cutter for use by Designers for in-house card models. CAD files of a project can easily be modified to make them cut-ready for our machine. All pieces of the model can be cut with extreme accuracy and detail. Once we start the cutting process our turn-around time including delivery is 24 hours.